Harvest - what happens when it fails? From 1845-52, the failure of Ireland's potato harvest devastated the population; a million people died from sickness and starvation, while from 1845-55 more than two million fled the country in a mass exodus, many arriving in Boston. Thousands died en route, in what became known a coffin ships. 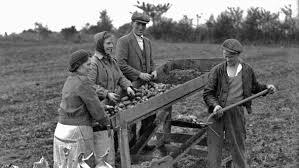 Dependence on a single variety of potato, the Irish Lumper, had made the crop particularly vulnerable to disease, while the exorbitant cost of grain had made it a staple food for the working classes. The crisis was worsened by the export of enormous quantities of Irish crops to Britain, which continued unabated throughout the famine. Potatoes were unique in many ways. Large numbers of them could be grown on small plots of land. An acre and a half could provide a family of six with enough food for a year. Potatoes were nutritious and easy to cook, and they could be fed to pigs and cattle and fowl. And families did not need a plough to grow potatoes. All they needed was a spade, and they could grow potatoes in wet ground and on mountain sides where no other kinds of plants could be cultivated. More than half of the Irish people depended on the potato as the main part of their diet, and almost 40% had a diet consisting almost entirely of potatoes, with some milk or fish as the only other source of nourishment. Potatoes could not be stored for more than a year. If the potato crop failed, there was nothing to replace it. In the years before 1845, many committees and commissions had issued reports on the state of Ireland, and all predicted disaster. In November, a scientific commission reported that “one half of the actual potato crop of Ireland is either destroyed or remains in a state unfit for the food of man.” By early spring of 1846, panic began to spread as food supplies disappeared. People ate anything they could find, including the leaves and bark of trees and even grass. Lord Monteagle reported to the House of Lords in March, people were eating food “from which so putrid and offensive an effluvia issued that in consuming it they were obliged to leave the doors and windows of their cabins open,” and illnesses, including “fever from eating diseased potatoes,” were beginning to spread. Conservative Prime Minister Robert Peel described the situation as "very alarming", and tried to repeal the Corn Laws which had artificially raised the price of grain, putting bread beyond the reach of many in Ireland. The motion failed to pass, and Peel's government fell in 1846. His successor, Whig leader John Russell, halted the relief efforts and refused to curb the export of Irish food to England. The blight did not go away. In 1846, the whole potato crop was wiped out. In 1847, a shortage of seeds led to fewer crops, as only about a quarter of the land was planted compared to the year before. The crop flourished, but not enough food was produced, and the famine continued. By this time, the mass emigration abroad had begun. The flight to America and Canada continued in 1848 when the blight struck again. In 1849, the famine was officially at an end, but suffering continued throughout Ireland. More than 1 million people died between 1846 and 1851 as a result of the Potato Famine. Many of these died from starvation. Many more died from diseases that preyed on people weakened by loss of food. By 1847, the scourges of “famine fever,” dysentery, and diarrhoea began to wreak havoc. People streamed into towns, begging for food and crowding the workhouses and soup kitchens. Those who took to the roads were infected with lice, which transmit both typhus and “relapsing fever.” Little, if any, medical care was available for the sick. Many of those who tried to help died too. In one province, 48 medical men died of fever. There have been many famines in far flung African countries: We see appeals on television, Western governments send aid, people motivate to try to help. I can't imagine the anger that the impoverished Irish felt towards their British rulers when they turned away. Most Irish peasants lived in tiny stone cottages, along with their children and pitiable livestock. The land was hard, the soil difficult and the potato was king. The potato crop was all they had to sustain life. When the crop failed - life failed. Spins up a dark shower of roots and mould. Wicker creels. Fingers go dead in the cold. To fish a new load from the crumbled surf. Make a seasonal altar of the sod. by the spade, they show white as cream. Good smells exude from crumbled earth. promises taste of ground and root. To be piled in pits; live skulls, blind-eyed. wolfed the blighted root and died. three days in the long clay pit. Millions rotted along with it. faces chilled to a plucked bird. beaks of famine snipped at guts. were grafted with a great sorrow. Hope rotted like a marrow. you still smell the running sore. The rhythm deadens, the workers stop. Libations of cold tea, scatter crusts. I remember studying this in A-level history. One phrase - "masses of putrid slime" - still sticks in my mind as a description of the devastated crops. The Seamus Heaney poem is brilliant - good choice. Thanks Adele.